Do you remember when you believed in magic? It is 1917, and while war wages across Europe, in the heart of London, there is a place of hope and enchantment. The Emporium sells toys that capture the imagination of children and adults alike: patchwork dogs that seem alive, toy boxes that are bigger on the inside, soldiers that can fight battles of their own. Into this family business comes young Cathy Wray, running away from a shameful past. The Emporium takes her in, makes her one of its own. I loved this book. As a child I loved stories about magic, stories that transported me to another world, but The Toymakers is not a children’s story. It is an extraordinary, magical and wonderful book that captivated me, a book set mainly in 1917 whilst the First World War was taking its toll of humanity, leaving despair and tragedy in its wake. It’s a blend of historical fiction and magic realism.This is a story of love, and family relationships, as well as of the devastating effects of rivalry and war. Papa Jack’s Emporium in London is a toyshop extraordinaire. It opens with the first frost of winter each year and closes when the first snowdrop blooms. And the toys it sells aren’t ordinary toys – they seem alive, from patchwork dogs, to flying pegasi, Russian dolls that climb out of one another, runnerless rocking horses, whales that devour ships, fire-breathing dragons and many others to the toy soldiers that wage war on each other. The story begins in 1906 and ends in 1953, following the lives of Papa Jack Godman, his sons, Kaspar and Emil and Cathy Wray, who aged 15 and pregnant had run away from home. Cathy finds sanctuary at the Emporium, and Papa Jack tells her how he came to live in London and founded the Emporium, how he had found in making toys a kind of magic, a way of reaching a man’s soul. At first Cathy lived in the Wendy House, which like the Tardis is larger on the inside than the outside, with Sirius the patchwork dog. It was where her daughter, Martha was born. Kasper and Emil are caught up in a battle for control of the Emporium, and they both fall in love with Cathy, but it is Kasper that she marries. The years pass, the First World War breaks out, Kasper joins up, but Emil’s application is refused, so he stays at home, developing his toy soldiers. I was struck by the irony and pathos of a world at war mirrored in the battles fought by Emil’s toys soldiers. And things come a head when Kasper returns a damaged man and retreats into his mind. What happens next changes their lives for ever. 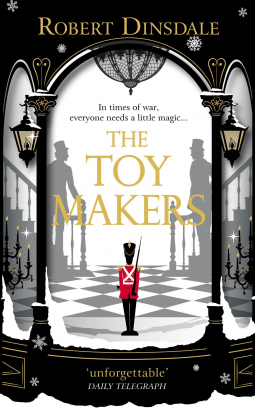 The Toymakers is a wonderful book, one that will stay with me, not just about the horrors of war and rivalry, but above all about the power of love, the magic of childhood and the effect of toys – when you are young you play with toys to feel grown up, imagining what it will be like to be an adult. But when you are an adult what you want from toys is to feel that you are young again. They remind you that the world was once as filled with magic as your imagination will allow. Many thanks to the publishers for a review copy via NetGalley. This sounds fascinating. Is there a story behind Kasper and Emil’s heritage? Those sound like German names. How are they treated by the locals during the war? Papa Jack’s name was Jekabs Godman, born in the heart of the Russian Pale – ie a Russian Jewish. He tells Cathy the story of how he was arrested and left Russia. As the War started Papa jack told his sons ‘London loves its toymakers from the East … until it doesn’t.’ Shop doors owned by foreigners, including the Emporium, were smeared with blood and viscera was spread in front and people shouted ‘foreign dogs’ at them. Emil, who had tried unsuccessfully to sign on, was presented with a white feather as a mark of cowardice at not defending the realm. But the Emporium struggled on. I like the sound of this one. Many books right now about the WWI time period, probably because it’s 100 years down the road. Does Kasper have PTSD? Just curious – don’t mean to ask for spoilers. The book I’m reading now has a character that returns from WWI with ‘shell shock’, today’s PTSD. Kay, I don’t think shell shock as such was mentioned. Kasper was gassed and I think it was that and the horrors of what he had experienced that broke him.